together. I then took the measurements I had and transferred them to the pink insulation foam. I had hoped to use a longer knife to cut the foam, but all I had at home was my x-acto knife. It worked, but not all of my cuts were perfectly straight vertically. Actually, none of my cuts were perfect vertically. Using the same sketch, I transferred my measurements for the top section and then cut it out and test fit it with the bottom piece. With the two pieces on top of each other, I could now start planning out the rest of it. 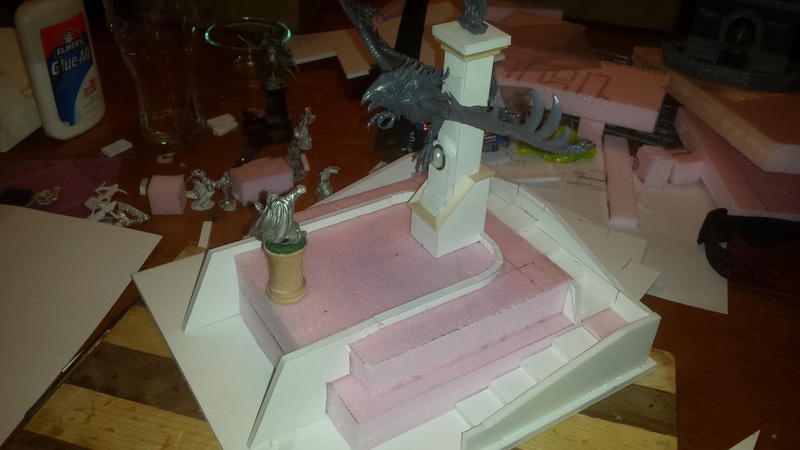 I placed the phoenix and the cleric on top and started gauging measurements. From the looks of things I was going to end up with a 1" walk way around the fountain. The plan for the rear section of the top was to use part of it for the ramp in the back as well, but that turned out to be a no go, since the incline was too steep. I ended up cutting that off. I had originally planned to make a ramp all the way around the lower section, to allow models of any base size to walk up it easily. But after playing around with it, it ended up not working out and I went with 1 inch deep stairs instead. 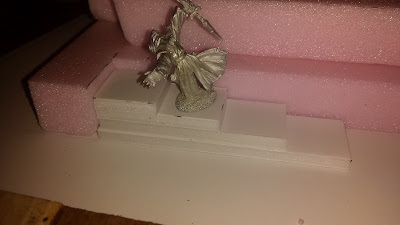 The stairs turned out to be the better choice and they'll easily allow minis with 25mm round bases and standard molded bases to fit on them. Anything with 1 inch square base or larger round base isn't going to fit though. Once the stairs were all figured out, it was time to attach things together. 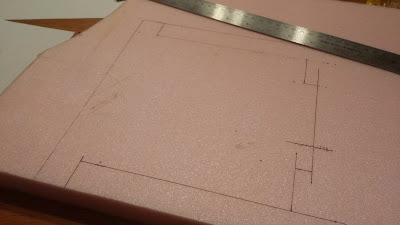 I cut a piece of foam core board so that it left a 1/4" space all around the bottom of the piece. This way it can be painted up like a curb to give it more of a urban city feel. Plus it needs to match up with the river pieces I'll be making later. Then it was time to bust out the hot glue gun. Over the years, I've found that when it comes to dioramas, there is a glue for every purpose. Elmers works great for paper to paper, Super glue is great for cork to wood. 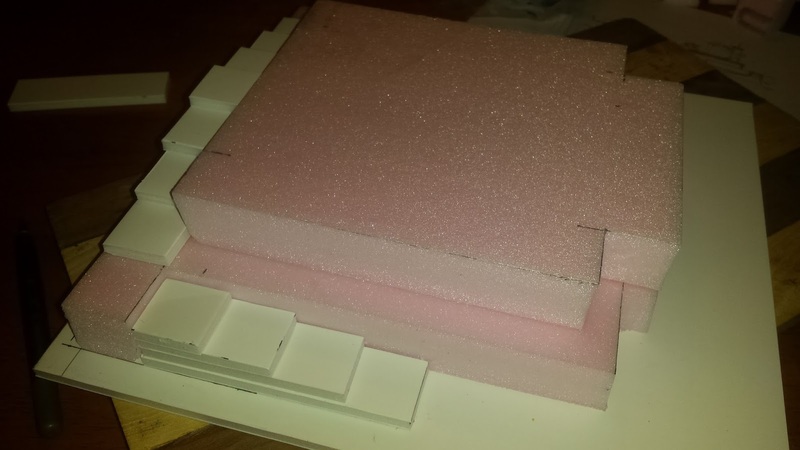 But pink foam doesn't like white glue and super glue melts it. Enter the hot glue. It dries fast and sticks this stuff to anything. The only issue is, you need to work fast or else the glue cools and hardens before you know it. 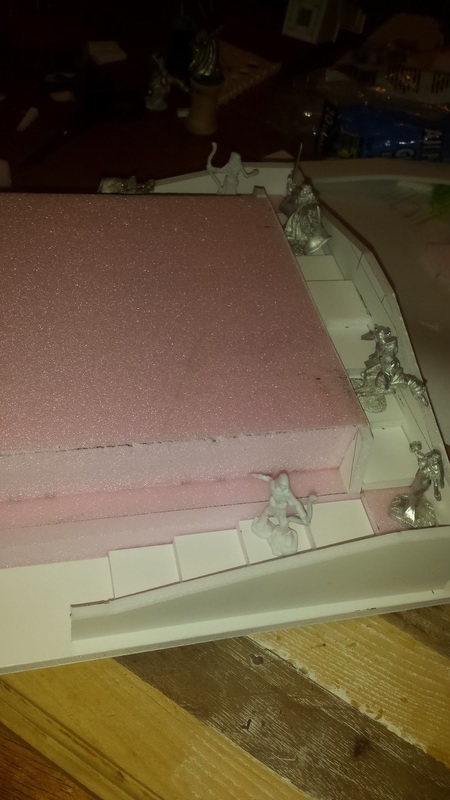 With the foam all glued onto the base, it was time to work out some walls for the stairs. I based the height of the wall off of my previous fountain's rim height, which ended up being 5/8s of an inch tall.It seems like a proper height, without being too tall. Some minis work better in it than others. I have a sword & shield vampire from my original warband that has a tight fit in it, because of his cloak. But after testing it with many other minis it seems to be the exception, not the rule. After I finished making the walls I started working on the fountain area itself. I placed the phoenix on there and moved it around to see what would work. I ended up leaving a 1 inch walkway around the fountain and decided to have the wall around the fountain pool terminate at the statue. I really like how it's turning out so far. In case you're wondering what the small ledge is going to be for, it is going to be a planter. So there will be dirt and plants of some sort in there. I'll be trimming it out with some wood to give it a rim, as well as trimming out the stairs to finish them off. 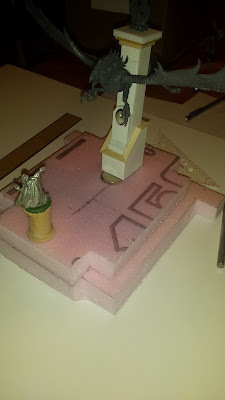 I've since decided that the plinth for the cleric statue looks off. So I'll be making a new one for him out of foam board. It'll jut out from the waterfall a little bit as well to make it more interesting. That's all for now. This is really shaping up a lot better than I expected! I picked up some polymer clay stamps that I can use to add some brick patterns to the ground level and upper floor. I need to find some clear plastic sheet that I can use for the phoenix and pool waterfalls yet too. Once this is done it's time to make the river, bridge and I decided I'll make a cap piece that'll match up to the fountain, in case we want to use it as just a fountain and not a part of the river. If you want to see my projects unfold as they happen, instead of waiting for WIP posts, you can catch me on Twitter and Instagram @ryglore.